The 60-Minute Thai Alphabet is based on a scientifically proven memorization technique that enables you to find connections between new information and things you already know. Using this recall technique, you can learn the Thai alphabet today in record time! The book uses creative illustrations to assist you in recalling the shape and sound of the Thai letters. When you see the Thai letter, you simply recall the illustration and apply the associated sound. Simple! The 60-Minute Thai Alphabet book helps you overcome the difficulty of learning an alphabet that is entirely alien to your brain. This technique has worked for over 25,000 people, and is something every single person has the capability to do. There are 44 consonants and 32 vowels in the Thai Alphabet. Many of the vowels are long and short versions of each other, so it is actually only necessary to learn 20 different vowel forms. Now, I know what you’re thinking, “44 consonants and 32 vowels! I’m only used to 26 letters!” But don’t worry, you’re about to learn a technique that will help you effortlessly master the Thai alphabet. 1. Low – spoken in the lower part of your voice register. 2. Middle – spoken in the middle part of your voice register. 3. High – said in the higher register, as if you are calling someone at a distance. 4. Falling – for example, like the word ‘no’ when saying “oh no” if you’re disappointed. 5. Rising – for example, like the word ‘coming’ when asking someone, “are you coming along?”. Thai consonants are broken down into three groups, known as classes: low, middle and high. These groups don’t mean that the consonant will be low, middle or high in tone, it’s just an easy way of separating the consonants into groups. The reason you need to know the class of a consonant is because the class affects how a syllable is pronounced. So you basically have to recall the sound and the class in order to learn the alphabet. When a High Class consonant with the sound ‘S’ is followed by a dead-sound (i.e. a sound that ends quickly like at or an), the tone of the syllable is Low. When a High Class consonant with the sound ‘S’ is followed by a longer, open sound (like an ‘m’ sound) the tone of the syllable is a Rising. It might seem somewhat complicated, but once you master the Thai letters and classes with the special technique we’ll discuss below, it’ll be easy-peasy! Using The Amazing Memory Recall Technique! The key to remembering something is to create a leverage point. Think about it like this; have you ever seen something that has reminded you of a precious memory? Perhaps a particular food has reminded you of an ex-partner, or a particular saying of a relative. As humans with advanced brains, we are constantly making associations with people, events and places that merge into the sub-conscious, only to reemerge when we encounter them again. You’ve never encountered the Thai alphabet before; it wasn’t drilled into your brain as a child. But the western alphabet was, and so were millions of other images and words, things that that can help you recreate leverage points and subsequent connections with the Thai alphabet. And that’s what The 60-Minute Thai alphabet book does for you. You’ll have an automatic connection for every letter, shaving months off the learning process. This Thai consonant is named ‘Chor Ching’. 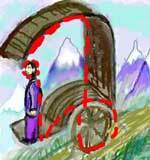 In the illustration it is represented by a chariot driving through a High Mountainous Terrain. The similarity between the two is highlighted by the dashed red-line in the image. This image encodes all the information that you need to recall when you see Chor Ching (the Thai letter). 1. High class consonants have a mountainous background. 2. Middle class consonants have an urban background. Simple, logical and easy to learn! 1. You see the Thai letter and your brain associates it with the image you’ve learned. 2. The name of the Thai letter springs to mind because of the shape and sound. 3. The background image tells you the letter (consonant’s) class. 1. The outline of the man with the dumbbell helps you recall the shape. 2. The sound is ‘T’ for training. 3. The class is low because he is at the seaside. Learning the Thai Alphabet doesn’t get any easier than this! Within 60 minutes you’ll be writing letters and reading words! What’s more, we’ve thrown the Thai number system in there for you too, which very few foreigners ever learn. The book downloads in PDF format, so you can learn on any digital device, including all smartphones and tablet devices. Download your copy for just $19.99 using the secure Buy Now button below. Look at the image and then close your eyes. Try to recreate it in your mind. See the shape and recall the sound and class. Do this one-by-one, at your own pace. Different people learn at different paces, and although this book is entitled The 60-Minute Thai alphabet, you don’t have to learn it in an hour. Take your time, perhaps 5-10 letters an hour, testing yourself as you go. When you’re out and about, look at Thai signs and see if you can recall the pictures to remember the sounds. Keep testing yourself all the time. Don’t worry if you make mistakes! Although this memory technique is scientifically proven to work best for adults, you are still human, after all! 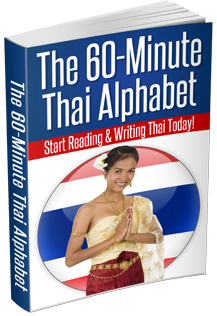 Download The 60-Minute Thai Alphabet Book Instantly!